If you want a better SUV, look no further than the new Platinum edition of the 2017 Toyota RAV4. You’ll find a deal at Pitts Toyota dealer serving Dublin, GA. Get financing. For a more premium look, the Platinum trim is the same color at the body. LED lighting and foglights are Platinum standards. Toyota also provides self-regulating high beams for greater safety. This edition has a five-door Smart Key. You just touch the door handle with the key in your pocket. The liftgate raises automatically if it senses the key in close proximity. SofTex upholstery covers both rows in a leatherette fabric that is durable and soft. Sill protectors and ambient lighting add to the upscale feel. The front row seats are heated power-adjusting chairs while the second row can recline. A split-screen touchscreen offers Entune apps, navigation, and HD radio. Eleven speakers line the cabin with sound from premium JBL audio. An autobrake is ready to respond when the crossover faces a forward collision danger or a pedestrian in the vehicle’s path. Of course, the system is designed to give the driver a chance to respond by using visual and audible warnings. Likewise, the steering assist may take corrective action if a lane departure warning goes unheeded. A step toward automation, radar-enhanced adaptive cruise control is ready to help. With a bird’s eye system and a blind spot monitor, Platinum editions use cameras and sensors to expand the driver’s awareness of his/her surroundings. 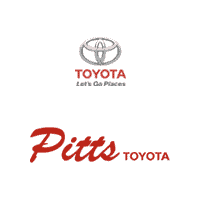 You can find the Platinum RAV4 when you visit Pitts Toyota dealer serving Dublin, GA.